ScooterNova issue 2 – order now! 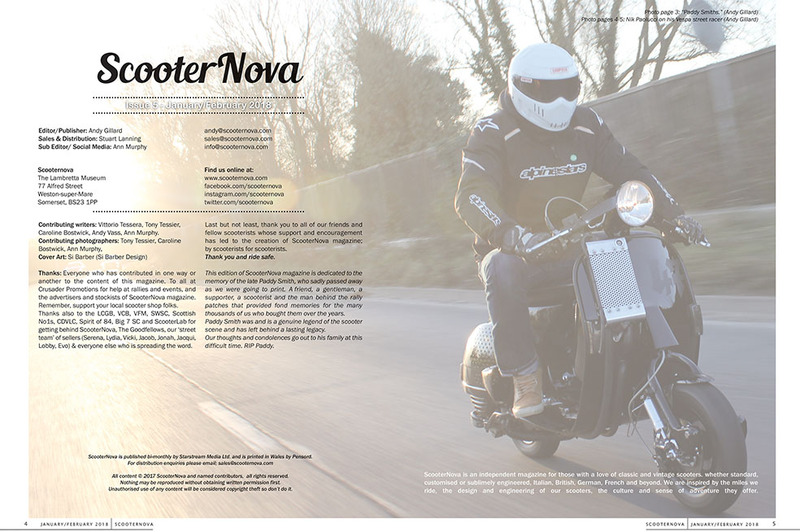 We’re pleased to announce that despite the scorching hot weather, we finished the second edition of ScooterNova magazine this week and it’s now in the hands of the printers. As we escape the office, off on our vintage scooters for an Awfully Pleasant weekend away, we would like to inform all those who have subscribed and pre-ordered that your magazines should be in the post to you at the end of next week. Scooter shops who stock ScooterNova magazine will also have their supply shipped out to them as soon as the pallets arrive from the printers, so keep an eye on your letter box folks! For those who have yet to subscribe, would like to pre-order, or simply don’t have a stockist nearby and cannot wait until Cleethorpes scooter rally where we’ll be celebrating the launch of issue 2, well it’s not to late to sign up online and have your next copy of ScooterNova magazine shipped out to you next week. Simply visit the Scooter Products website here, and fill in your details. You can also order by credit card over the telephone, weekdays from 10am to 2pm, by calling 01934 417834. Scooter shops interested in stocking ScooterNova magazine are also invited to contact us for details.